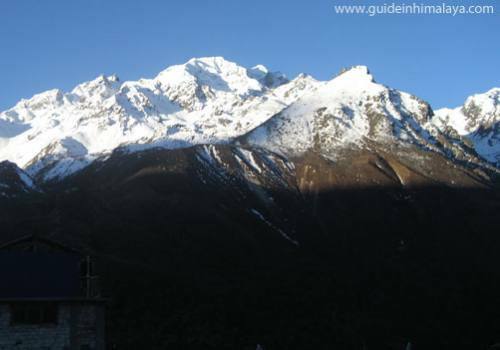 Main Highlights of Helambu Trek: Excellent views of mountains that including the Langtang Range, Dorje Lakpa, Gauri Shankar, Dom Blanc, Ganesh Himal, Manaslu and even Everest, Yolmo Culture, Interesting Nepal Villages en route, Brahmins, Tamangs and Sherpas tribes of Nepal, Thanka painting, Buddhist Monasteries, religious monuments, Sacred Heritages and Pilgrimage Sites, Guru Rimpoche and Buddhist Saint Milarepa Meditated Caves, Beautiful flora and fauna etc. 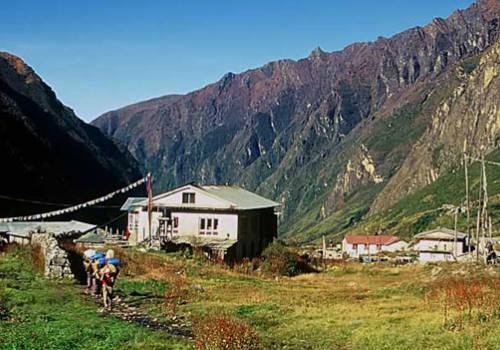 Helambu Circuit Trekking also well-known as “Yolmo Heritage” is an easy, naturally and geographically fascinating trekking tour that visitors can experience the mountains of Majestic Himalayan scenery, great opportunity to experience Green Landscapes and unique Yolmo Culture. 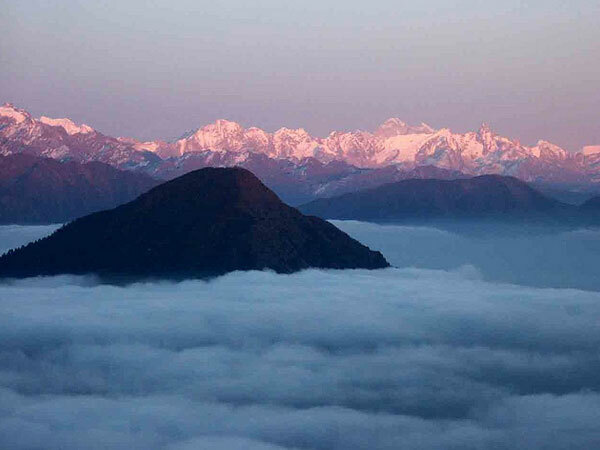 This trekking area is close to Kathmandu and easy access with low elevation. The trek passes through some beautiful rhododendron, pine and oak forests and interesting Nepal Villages en route. 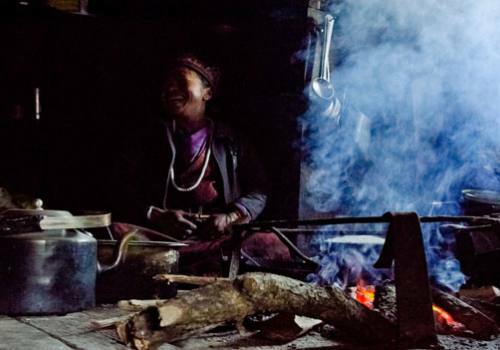 During the trip, we visit the homes of Brahmins, Tamangs and Sherpas tribes of Nepal. The ranges of mountains that rise above us match the diversity of the people. 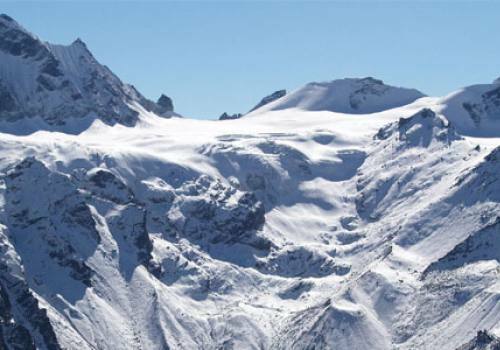 From low altitudes, we have excellent views of mountains that include the Langtang Range, the Annapurnas, Manaslu and even Everest on a clear day. It is located something about 70km north of Kathmandu Valley, it is an area inhabited by Sherpas, Tamags and Chetrries. The language, culture and dress of the Helambhu Sherpas are very different from those who live in Khumbu area and Rolwaling. The region is very famous place for aThanka arts. 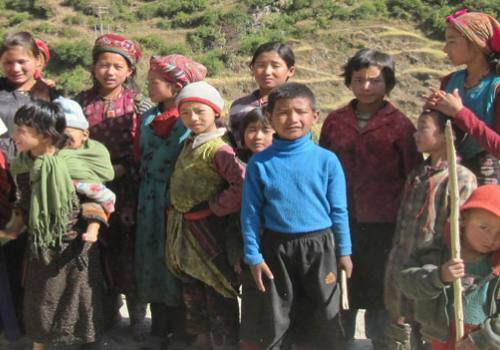 According to history, Yolmo people are from different communities of Nepal and Tibet. Yolmo is almost directly north of the Kathmandu Valley, just inside Nepal but bordering on Tibet. In Nepal the region is called Yolmo (spoken by Buddha/ Guru rinpoche/ Marpa/ Milarepa etc.) or (Helambu by most of Nepalese). The name of Yolmo is widely used by Buddhas and Bodhisattvas from centuries ago and is still in use by great Tibetan Masters and great practitioners, although most of Yolmo persons and others call the name of region as Helambu, it is believed to be the nickname for Yolmo given by mistake or lack of knowledge by some of the unlearned Yolmo persons. They speak a Tibetan-derived language called Yolmo language (which is totally different than Nepali language), the Yolmo language are mostly understood by Tibetans from central Tibet (Lhasa) and some other parts of Tibet. One can find the most of Yolmo words in almost every Tibetan dictionary. The Yolmo peoples have close cultural and linguistic affinity with the inhabitants of the Kyerong and Rongsyar areas of Tibet. Trade, tourism, Thanka painting, carpet weaving and farming are common occupations of Yolmo. Long ago, Yolmo people were Yak herding people and main source of income was based on Herding. The number of Yolmo peoples in Nepal is disputed. The Yolmo Community itself claims their population to be in excess of 150,000. The word ‘Yolmo’ is mentioned in many religious manuscripts of Tibetan Buddhism and is considered as a holy region which in Tibetan or Yolmo is called "Bhe-yul Yolmo" or Hidden Valley. Many great Buddhist masters practiced in Yolmo, including the Tibetan yogi Milarepa , Guru Rinpoche and Yolmopa Terton Ngagchang Sakya Zangpo. Yolmo is famous for innumerable holy and sacred sites. Among the famous caves there are Tag-phug Sen-ge Jong (The Tiger Cave Lion Fortress) just below the village of Tar-kye Gyang, where Milarepa sang his "Song of a Yogi´s Joys", Yang-dag Tsoe-ki Drag-phug (Completely Pure Supreme Cave) which is locally known as "Drub-phug" (Cave of Accomplishment) at an altitude of 14,000 feet, where Guru Rinpoche stayed. Nearby there is a small cave called "Khandro Sang-phug" (The Dakini´s Secret Cave) where his consort Shakya Denma (Shakya Devi) stayed. Another cave of Guru Rinpoche is found in Pema-thang (Tibetan: Zema-Thang= Sandy Flats) a small hidden valley within Yolmo. There is another cave of Guru Rinpoche in Yolmo, re-discovered by Jyadral Sangye Dorje Rinpoche in 1984, which is called Yanglashel (not to be confused with a renowned cave of the same name in Pharping, Nepal). Near the village of Milimchhim is yet another cave in which Padmasambhava stayed named "Nyida Rang-zung" (Naturally Appearing Sun and Moon). So on, just below Tarkeghyang Chiri Monastery, said to be the primitive old and historic Buddhist Monastery in all over Yolmo region is the Dzo-dril or Chudi Monastery or Chiri Chuklakhang foundd by Yolmo Terton Ngagchhang Shakya Zangpo It is situated just at the basement of Holy Mountain in the north of monastery called Ama Jyomo Yangri. 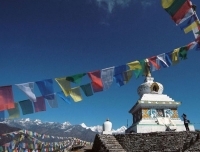 The Yolmo language is close to the Tibetan language and consists largely of classical Tibetan terminology as used in Religious scripts-´Pechas´. The Yolmowa dialect belongs to the Tibeto-Burman language group and uses the same script as the Tibetan people, which is widely used in their religious books. 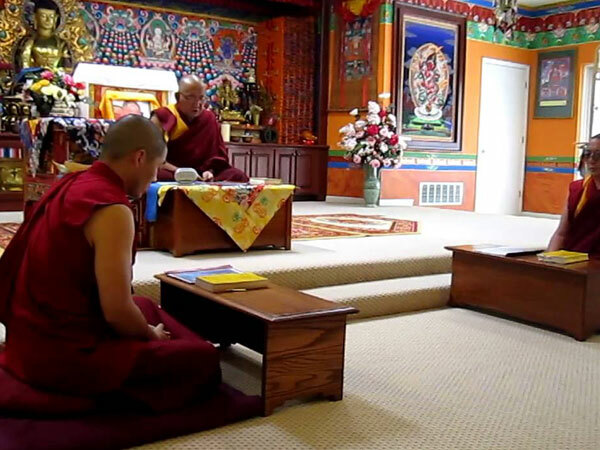 It is spoken by most of central Tibetans but the difference is only in the way of speaking the words. The people of Yolmo celebrate Sonam Losar but different time,One month earlier then Tibetan and customs differ to Tibetan Buddhists. Sonam Losar is all over in Nepal also celebrated by anoth ethnic group of Nepal like Sherpa people from Khumbu region of Khunde Khumjung, Thame, Phortse, Thame, Tamang people from Rasuwa, Langtang, Gurung people from Manang, Mustang etc. Apart from this great new year festival Yolmo people also celeberates other relieous festival such as Nhara, Tse chu, Buddha Jayanti and Manu Bum. In th Yolmo community traditionally the men wear Tshuba (alike Tibetan male dress) and Ladies wear Tshuba and Burisurku. 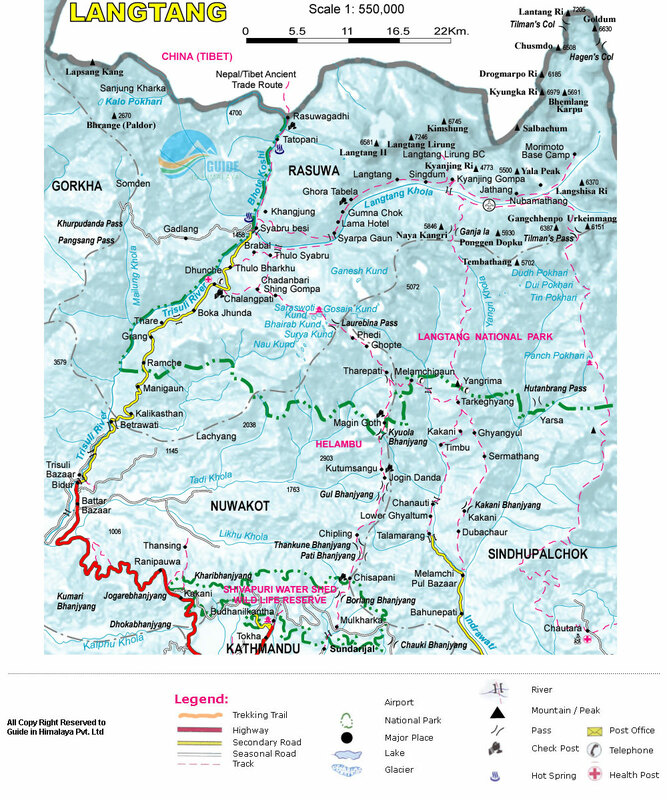 Drive to Sundarijal and trek to Chisapani (2215m) about 4-5 hours walk. Trek from Chisapani to Kutumsang at the altitude of 2470 meter, approximately. 6 hours walking today. Trek from Kutumsang to Mangengoth (3220m), approximately. 5-6 hours walk to Mangengoth from Kutumsang. Trek from Mangengoth to Melamchi Gyang (2530m) approx. 4-5 hours walk. Day excursion to Ama Yangri Peak (3771m) that takes 5-6 hours for round trip. Ama Yangri is sacred peak and offer stunning view from the summit. An experienced licensed English speaking local hiking guide. One sharing porter between two trekkers for carrying your stuffs. An assistant guide if the group size is above 8 people. All meals: 9 Breakfast, 9 Lunches and 9 Dinners during the trek. Local ground transfers to and from trekking. Food, accommodation and wages of your guide and porters. 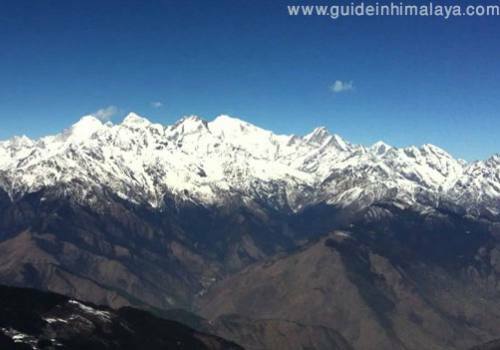 All required group trekking permits for Helambu trek. All local taxes and insurance of your trekking crew. Airport transfers, meals and accommodation in Kathmandu.